Are you planning to give your dull and drab dining space a refreshed look? The best you can do is a little makeover to the same furniture instead of shelling out your hard earned money for buying a new one. 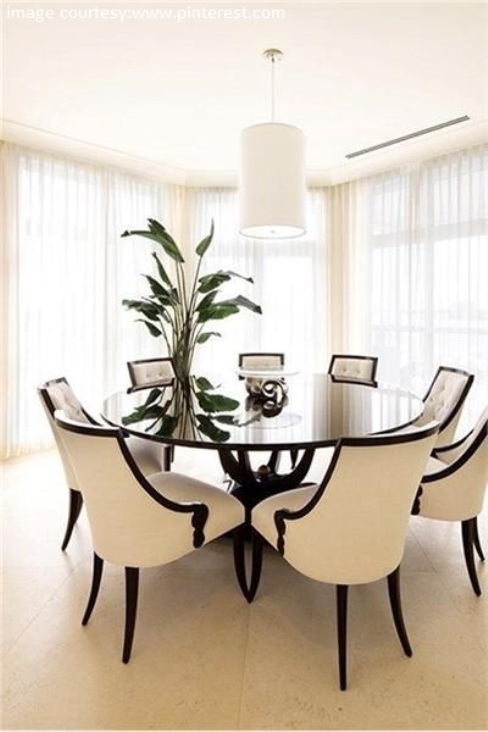 Aside from the fixture, decorations, and furniture, you must think of your dining table in the very first place. It’s the centrepiece of the entire space and you cannot just ignore it. What you can actually do with your dining table often becomes a major concern, when you are considering a full-fledged decoration or renovation of your dining area. Buying a new table is not always a viable option. Financial constraints often pose the greatest hindrance to it. So, why not add something ornamental like glass tops on your old dining table? I found it a great way to enhance the look and feel of the dining space while decorating my 4 BHK residential apartment near Chetla. I did not have plans to invest in new furniture when I shifted to my new apartment. Since I have a strong affinity for an archaic arrangement in the interiors, I was somewhat reluctant to let go of the furniture of my grandmom. But, over a period of time, they have lost their lustre and it’s time to perk up its age-old grandeur and nothing can get this aptly other than the glass table tops. The pristine elegance of glass table tops is timeless. What’s more! You can get it customized as per your taste and preference. Available as tinted, cut, finished and buffed, glass table tops come with many different choices, in terms of variety and designs. But, before you invest in the same, consider several factors on a priority basis. In fact, you just cannot pick up anything that catches your gaze. Chances are, whatever you have bought is not appropriate for your home. Hence, it’s imperative to take the thickness, design, tint and the edge of the glass into account. Glass table tops nowadays are being extensively used in every household. Not only does it makes the area look larger, but also imparts a characteristic elegance to your old dining space. With the right kind of tabletop, you can create wonders. Moreover, glass does not scratch as well as retains its brightness for a long time. It also requires the least amount of maintenance. As far as the designs of the glass table tops are concerned, I would personally recommend the mix and match style. It accentuates the elegance of the space in a unique way. Be it a traditional look, or something immensely chic, a glass table top fits all your requirements without posing any problem. You can even consider adding a little personal touch to your glass top, by etching out some text or image onto it. Nowadays, glass engravings are also popular and for a personals touch, you can get your name engraved on the glass tops. Keep in mind that nothing can beat the elegance of glass tops if placed rightly. If you have a creative bent of mind, you can easily achieve any designs of your dream.